This PDF 1.5 document has been generated by Adobe Illustrator CS6 (Windows) / Adobe PDF library 10.01, and has been sent on pdf-archive.com on 14/05/2015 at 15:20, from IP address 120.63.x.x. The current document download page has been viewed 336 times. File size: 571 KB (1 page). Study with William Dalrymple, use a 3D printer and practise your cross stitch. 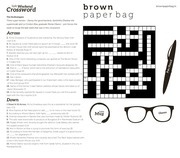 Skill time with bpb's recap crossword this week. This file has been shared by a user of PDF Archive. Document ID: 00231208.